Flower patterns during the spring season cannot be called a trend, they are a given. Luckily however, each season, florals are somehow reinvented. This time around, the alternative to predictable spring-related garments are bold and versatile short dresses. Graphic and colorful, these pieces are fresh enough for the daily heat but chic and fit for the city (no need of carrying around a piña colada or coconut handbag with you!). The variety of fabrics have a sense of being one of a kind, handpainted or vintage which contributes to the overall originality and glamour of each garment. Easily transformable from day to night, you will find that modern florals are able to substitute corniness for pure energy. 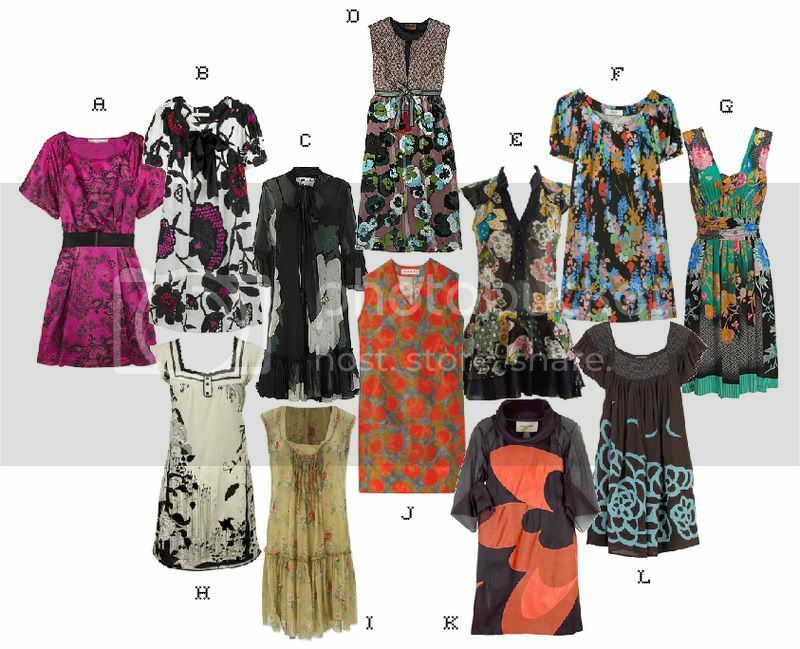 A.-Floral Print Dress by Phillip Lim 3.1; B.-Morgane Smock Dress by Diane von Furstenberg; C.-Riego Chiffon Dress by Diane von Furstenberg; D.-Profumo Empire Line Dress by Missoni; E.-Painted Dress by Miso; F.-Abstract Print A-Line Dress by Tibi; G.-Chinese Flower Print Dress by Etro; H.-Cream Mono Flower Dress by Miss Selfridge; I.-Printed Crinkle Silk Chiffon Dress by Max Studio; J.-Abstract Flower Print Dress by Marni; K.-Toso Chiffon Dress by Rue du Mail; L.-Alfa Cotton Dress by Antik Batik.